I’ve made a promise to myself that I’ll eat healthier this year and so far I’m doing pretty good. 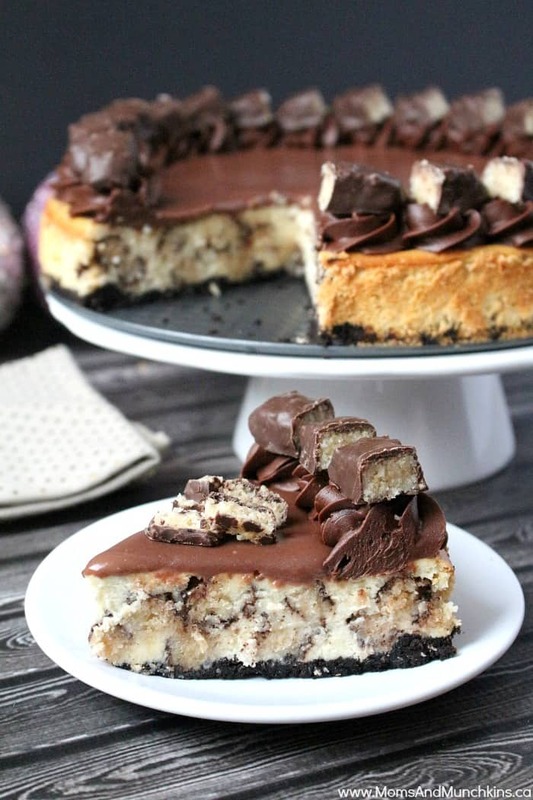 Why then have I been sharing so many dessert recipes lately? It’s all about balance, right? Most of my meals are healthy with lots of vegetables and fruit but an occasional treat is okay too. 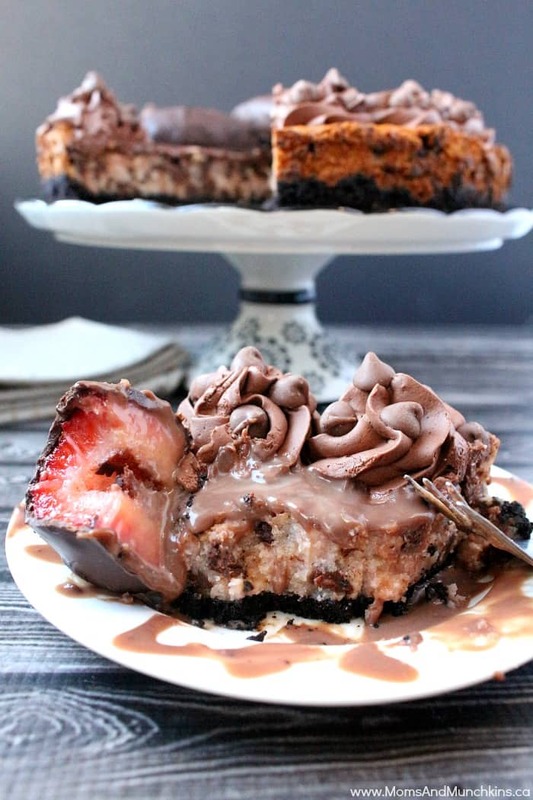 Plus this Chocolate Strawberry Cheesecake is topped with chocolate covered strawberries so it still falls within the “fruit” food group, right? Okay…maybe not but everyone deserves a treat! 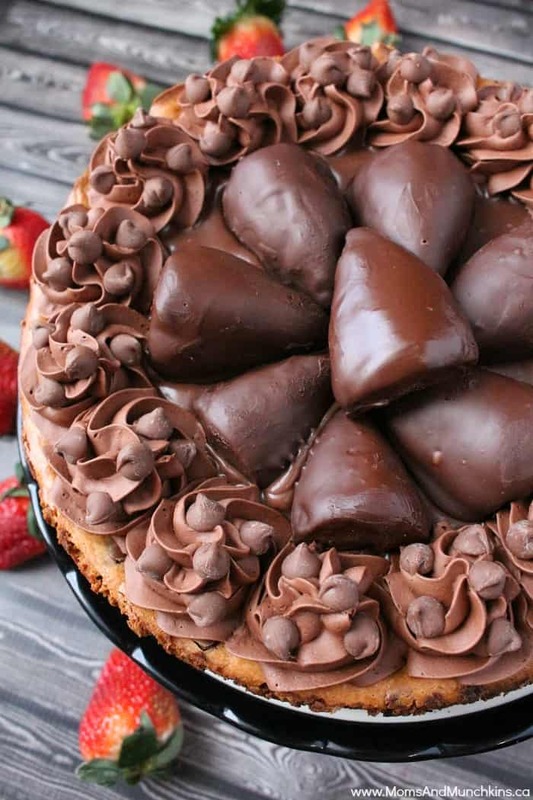 You could add chocolate covered strawberries to the top of this cheesecake (I use semi-sweet Bakers chocolate to coat the strawberries) or simply decorate the top with chocolate buttercream and ganache. Makes one small 9-inch cheesecake. For the crust, mix the cookie crumbs with the melted butter and press into the bottom of your 9 inch cheesecake pan. Set this aside. In a large bowl, blend the cream cheese and sugar until smooth. Add sour cream and vanilla, beat well to mix. Add flour and beat well to mix. Pour on top of cookie crust base and smooth down the top. Bake at 325F for 65-75 minutes. The middle should look set (not a lot of jiggle left in the cheesecake). Cover and refrigerate for 2 hours then run knife around outside of cheesecake to gently remove it from the pan. In a large bowl, beat (low speed) water, shortening and vanilla until well blended. Add confectioners’ sugar, cocoa and meringue powder and beat (medium speed) for 3 minutes. I use a Wilton 1M piping tip to add the buttercream to the top outside edge of the cheesecake leaving the middle top of the cheesecake open for the addition of chocolate ganache and/or chocolate covered strawberries. Place chocolate in a medium-sized bowl and set aside. In a small saucepan, heat cream over medium heat (stirring constantly) until it starts to boil slightly. Remove from heat and immediately pour into bowl of chocolate. Let sit 5 minutes and then add butter and stir until well mixed. Let cool in fridge about 30 minutes before pouring on the top of the cheesecake. 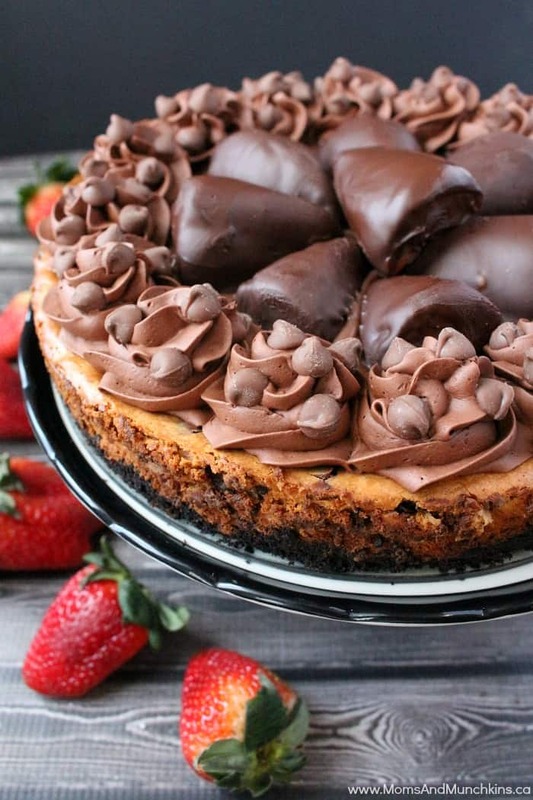 For another delicious cheesecake recipe, check out this Chocolate Macaroon Cheesecake. 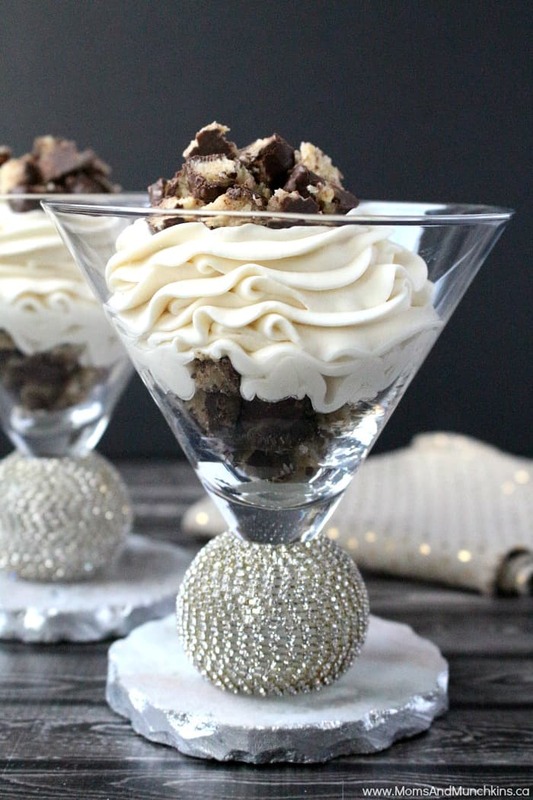 Or if you’re craving cheesecake but don’t have a lot of time, check out this No Bake Chocolate Macaroon Cheesecake Parfait. For more treats for your sweetheart, visit our special Valentine’s Day page. We’re always adding new & delicious ideas. For the latest updates, follow us on Facebook, Twitter, Pinterest, and Instagram.